Srinagar: Days after J&K Governor Satya Pal Malik claimed to have four kurta pyjamas only, Kashmiri political parties have sought investigation into the overcoat he was seen wearing Sunday. 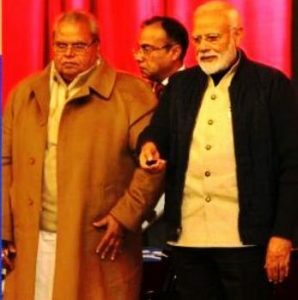 The Jammu & Kashmir National Conference, Peoples Democratic Party and Congress are asking India’s premier investigating agency to investigate where the light-brown overcoat flaunted by Malik during Modi’s visit came from. Three days back the Governor had declared that he came to J&K with four kurta-pyjamas and would leave the state with the same number of clothes. “We have not been counting your kurta pyjamas, but where the hell did this overcoat come from. Do you assume us to shut our eyes,” Omar Abdullah, former chief minister and National Conference vice president tweeted. Meanwhile, general secretary of National Conference Ali Mohammed Sagar accompanied by state Congress party president Ghulam Ahmad Mir and PDP senior leader Naeem Akhtar submitted a joint complaint at a CBI office in Srinagar. The three parties said they have also sort support of other parties and few independent politicians to put pressure on CBI to initiate probe against Malik. “We have seen CBI being used to settle personal scores but if the agency takes up this case, it will become clear that there is independence left in agency,” Mir said. Meanwhile, a spokesman from the Raj Bhawan refuted the charges against Governor and described them “baseless”.